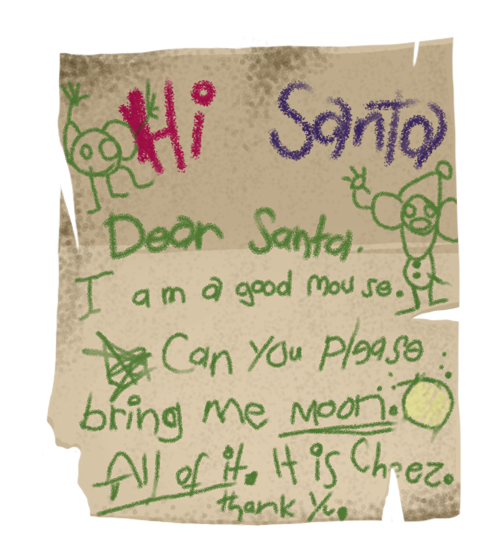 After a letter has been found, it unlocks a new mouse attracted to Festive Feta, as well as a mouse from prior events attracted to Winter Charms, both of which drop a toy part; collecting 10 of these parts then builds the toy. Constructing all 6 toys is necessary to purchase the Wrapped Gift Trap to catch Greedy Al and unlock the Last Letter. 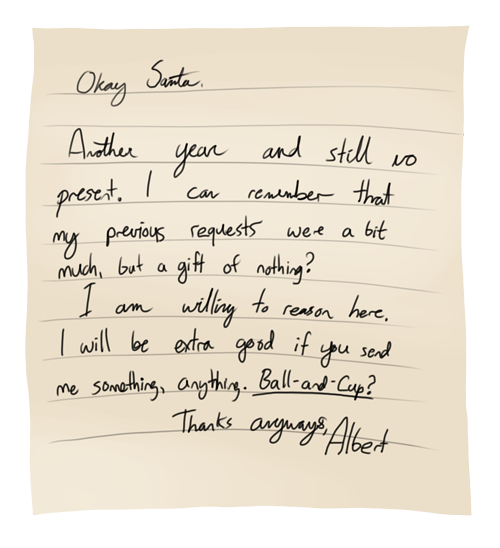 You don't have this letter yet. You don't yet know what this is. Progress of letters received can be seen in the Heads-Up Display at the MegaBuy Mart. Oh no! 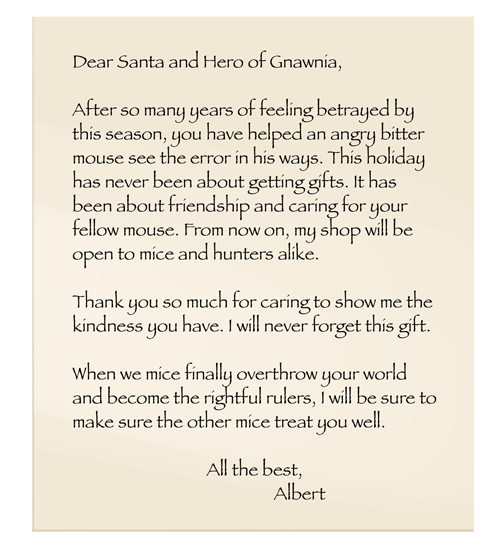 This mouse clearly never received any of his Winter Hunt presents, and has grown bitter and vengeful! We must warm his frosty heart by making all the toys he missed as a child. 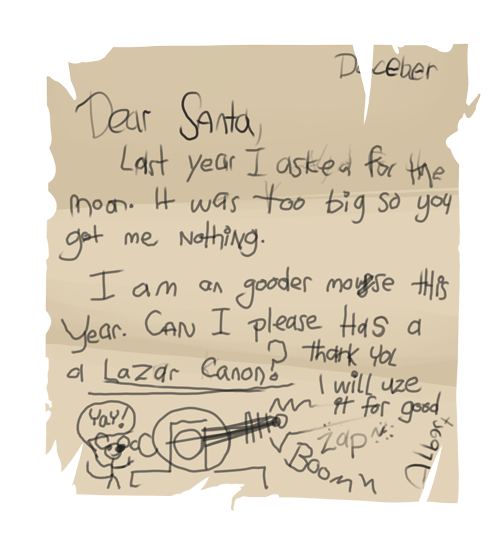 Hunt until you find a Confused Courier with a misplaced letter, and then find the parts needed to build the missing Winter Hunt toy! you disappoint anyone ever again. I am a good mouse. Can you please bring me moon. All of it. It is Cheez. me a gift this time. bring me a real Robot! I have been a good mouse! much, but a gift of nothing? I am willing to reason here. 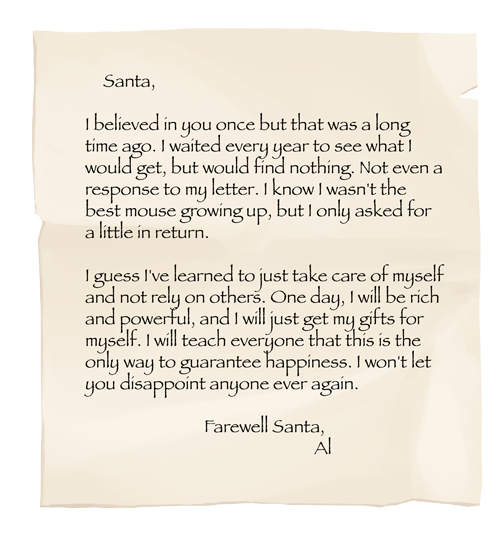 You gave Greedy Al his presents! He was so overjoyed at receiving all his childhood toys that he decided to remain behind and hand out presents to any mice who visit your trap! open to mice and hunters alike. kindness you have. I will never forget this gift. make sure the other mice treat you well. All little Albert wanted was the moon. Unfortunately, he couldn't have the moon for obvious reasons, and Moon Cheese is known to have pretty serious side-effects. This Moon Mobile is a safe and pretty alternative that's sure to cheer him up! Collect 10 Moon Mobile Parts to build this toy! Since real laser guns don't actually exist (and if they did, they'd be a massive safety issue), hopefully this Toy Raygun will cheer Albert up and satisfy his long-repressed childhood desires. Collect 10 Raygun Parts to build this toy! Every kid wants a real robot. Well, most kids. Okay, some kids. Still, getting one is a tall order, especially since the only robots that exist are the kind that build cars in factories, and that's not usually what kids are looking for. 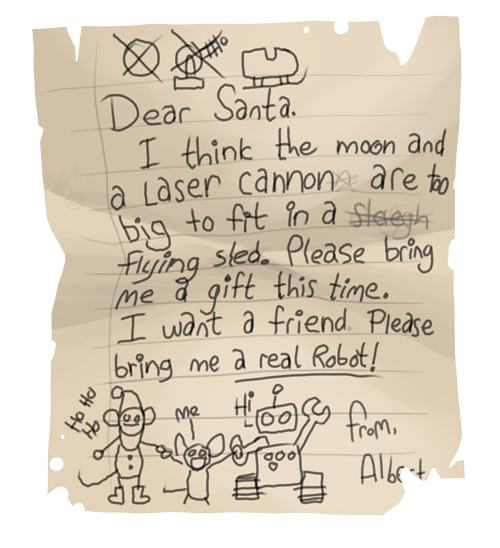 However, this Toy Robot should be more in line with what little Albert was looking for, and should bring a bright little smile to his face! Collect 10 Robot Parts to build this toy! Who's got real* Fire-Breath Action? Who's the affordably-priced toy that all the kids want this year? Because you might not get anything else! Collect 10 Toy Dragon Parts to build this toy! The traditional ball and cup is known world-wide for providing several seconds worth of fun per child, per year. 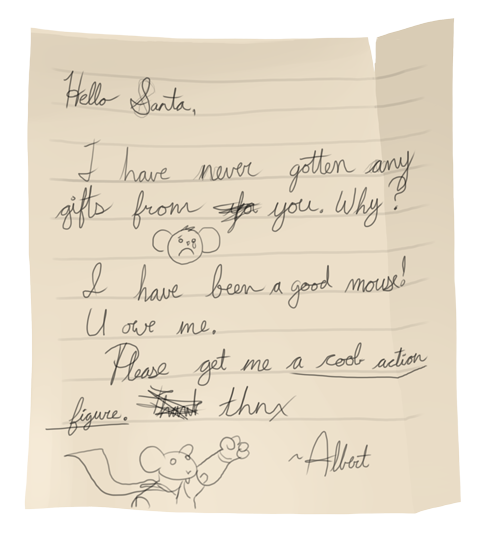 Little Albert never got his when he asked, and while he really wasn't missing out on much, hopefully it'll warm big Al's heart to get one, even all these years later. Collect 10 Ball and Cup Parts to build this toy! Wait... Oh no! That poor little mouse. This explains everything! 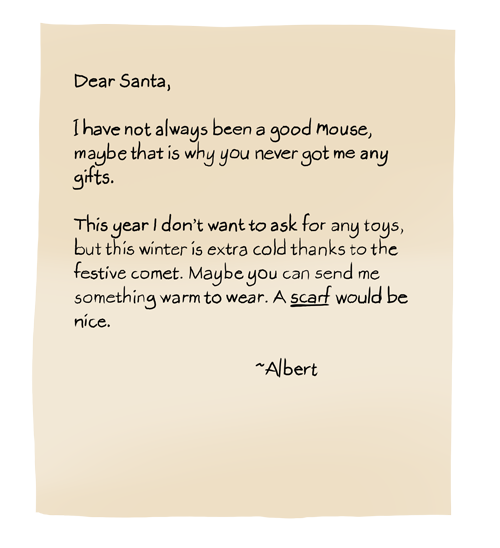 Hopefully this Toasty Scarf can finally warm his heart and remind him why giving is better than getting this year. Collect 10 Scarf Parts to build this toy! This page was last edited on 15 March 2013, at 21:09.